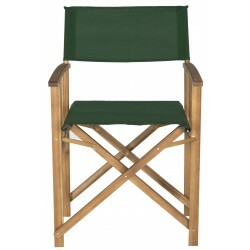 Use our outdoor side chairs to provide extra seating when hosting parties or guest visits. Free Shipping on all orders! 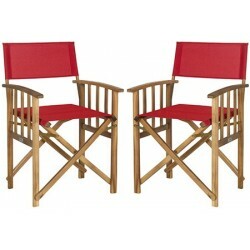 Perfect for giving your porch or patio a touch of Hollywood glam with a pretty and practical set of two Laguna outdoor director chairs.FREE Fast Shipping! 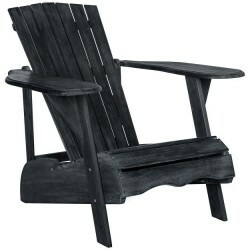 Inspired by the original Adirondack chair designed in 1903, the dark slate grey Mopani chair exudes modern rustic-chic charm. Created for sitting back and enjoying conversation, its wide arm rest and deep slat back are crafted of sustainable acacia wood. 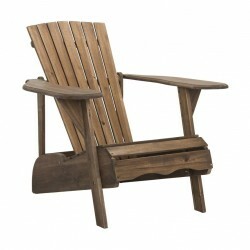 Inspired by the original Adirondack chair designed in 1903, the rustic brown Mopani chair exudes modern rustic-chic charm. Created for sitting back and enjoying conversation, its wide arm rest and deep slat back are crafted of sustainable acacia wood. 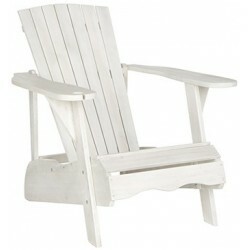 Inspired by the original Adirondack chair designed in 1903, the off-white Mopani chair exudes modern rustic-chic charm. Created for sitting back and enjoying conversation, its wide arm rest and deep slat back are crafted of sustainable acacia wood. 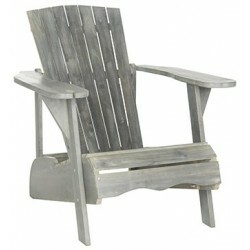 Inspired by the original Adirondack chair designed in 1903, the Mopani Chair exudes 21st century rustic chic charm. Created for sitting back and enjoying conversation, this chair’s wide arm rest and deep slat back are crafted for comfort of sustainable acacia wood in natural finish with galvanized hardware. 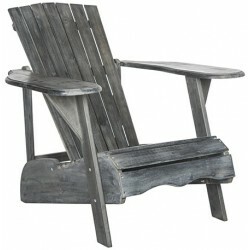 Inspired by the original Adirondack chair designed in 1903, the Mopani Chair exudes 21st century rustic chic charm. 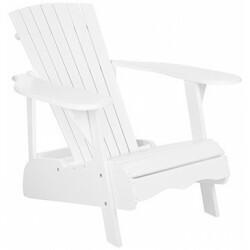 Created for sitting back and enjoying conversation, this chair’s wide arm rest and deep slat back are crafted for comfort of sustainable acacia wood in white finish with silver galvanized hardware. 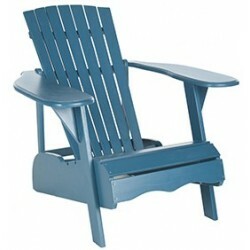 Inspired by the original Adirondack chair designed in 1903, the teal blue Mopani chair exudes modern rustic-chic charm. Created for sitting back and enjoying conversation, its wide arm rest and deep slat back are crafted of sustainable acacia wood. 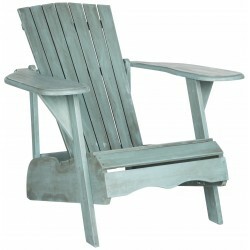 Inspired by the original Adirondack chair designed in 1903, the beach house blue Mopani chair exudes modern rustic-chic charm. Created for sitting back and enjoying conversation, its wide arm rest and deep slat back are crafted of sustainable acacia wood. 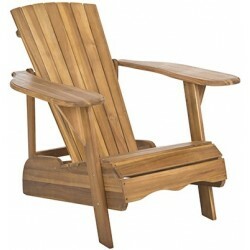 Inspired by the original Adirondack chair designed in 1903, the Mopani Chair exudes 21st century rustic chic charm. Created for sitting back and enjoying conversation, this chair’s wide arm rest and deep slat back are crafted for comfort of sustainable acacia wood in ash grey finish with silver galvanized hardware. Sit back and raise a glass to the view. 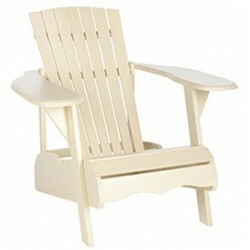 The Vista Adirondack chair now comes with its own drink holder. Faithful in every detail to this century-old classic design, Vista is crafted of eco-friendly antique white acacia wood to stand up to the elements. Sit back and raise a glass to the view. 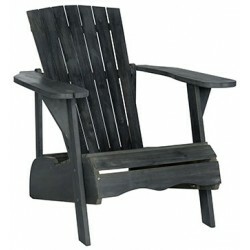 The Vista Adirondack chair now comes with its own drink holder. Faithful in every detail to this century-old classic design, Vista is crafted of eco-friendly acacia wood in ash grey to stand up to the elements. Sit back and raise a glass to the view. 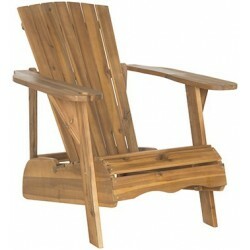 The Vista Adirondack chair now comes with its own drink holder. Faithful in every detail to this century-old classic design, Vista is crafted of eco-friendly dark slate grey acacia wood to stand up to the elements. Whether your style is country or coastal, the Salcha indoor-outdoor stacking side chair from Safavieh is a colorful solution to extra guest seating. 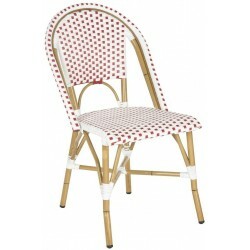 Chairs a la carte. 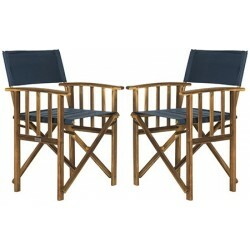 This casual outdoor chair is equally at home in a conversation grouping or at a dining table. Crafted of PE rattan in titanium grey, it comes with an upholstered sand cushion, and it is all made to stand up to the toughest weather. 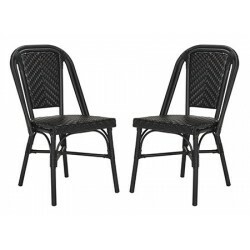 Reminiscent of classic Thonet bistro chairs, this set of two Ebsen side chairs by Safavieh is treated to state of the art materials for outdoor use. 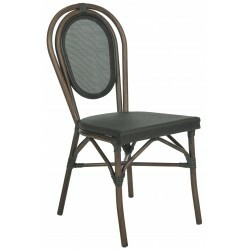 Crafted with aluminum frame and black Textilene fabric, this easy care design is pretty enough to use indoors. 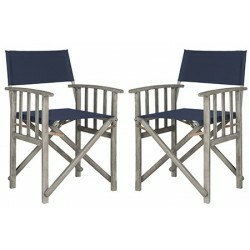 Chairs a la carte. 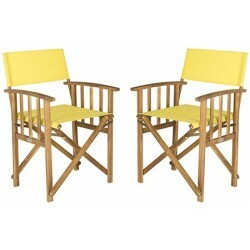 This casual outdoor chair works equally well in conversation grouping or at a dining table. 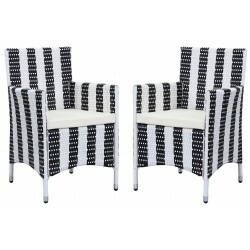 Crafted of PE rattan in a black and white awing stripe pattern with a cushion in sand, this chair is made to stand up to the toughest weather. Relax and unwind. 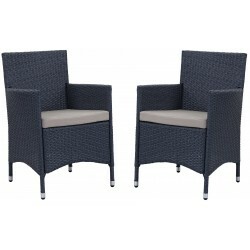 The New Castle Wicker Side Chair (sold in a set of two) is an update on classic wicker with new transitional style. Crafted with an aluminum frame in a tiger stripe pattern, it brings a bit of modern magic to warm summer nights.FREE Fast Shipping! Effortlessly elegant summer entertaining starts with the right furnishings. 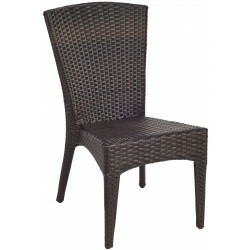 And the chic fan-back and sculptured style of the Newbury Wicker Side Chair (sold in a set of two) makes cocktails and canapés under the sun or stars a sophisticated affair.FREE Fast Shipping! Inspired by a posh outdoor café in the Marais, this contemporary stacking side chair puts a modern spin on the French classic. 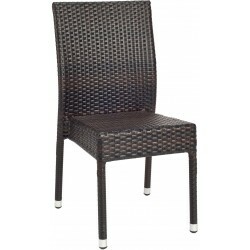 Its graceful curves and rich wicker texture feature a chic black hue that blends seamlessly into any kitchen or outdoor room.